I am reliably informed that as of 20 March CW’s electricity was reconnected – someone – probably Lancs. police [who have hounded CW for years] saw to it that her abode address wasn’t registered with the electricity company concerned, therefore the electricity was cut off. With the cold spell at the beginning of March well advertised before it happened, how cruel it was for them to have her electricity cut off just beforehand so she had no heating in her home? So cruel. 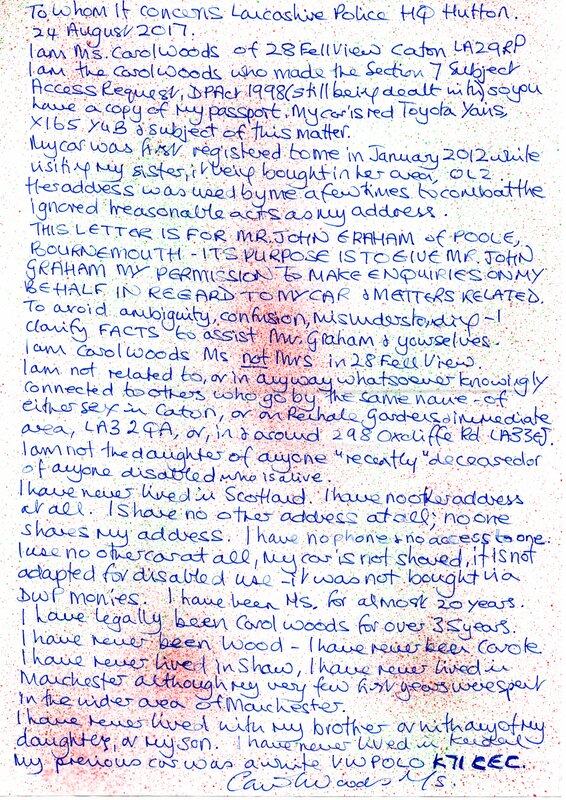 This letter was hand written on hand done paper to avoid “confusion” as to who may have written it. PLEASE SEE THIS ADDED WHICH FACT I HAVE JUST HAD CONFIRMED IN WRITING. 17 Feb 2018 and my electricity supply ILLEGALLY tampered with 7 35pm to cut me off, I have tried to contact SSE many times, leaving messages, emails and so forth and remained ignored until I finally spoke to a rep from SSE on Monday this week. She gave me the repair engineer’s details and I contacted them yesterday after my email again was ignored. (I like all in writing and now you know why.) A time was set for an engineer to call ( after 5 45pm) that was yesterday but no one called. No one called today as I waited until after 2pm before leaving to see what was taking place. I find SSE claim they HAVE NO RECORD OF MY ACCOUNT AT 28 FELL VIEW LA2 9RP, thankfully I have ALL bills of 4 years from when I moved in. But when I spoke to SSE on Monday they found my account right away. So, what happened between 4pm Monday and sending me the email received today? I TAKE THIS OPPORTUNITY TO RECORD THAT I HAVE STILL NO CUSTODY RECORDS FROM 31/1/18 NOR HAVE I A COPY OF THE TAPED INTERVIEW WHICH I BELIVE IS IN CD FORM NOW. imagine, had I not recorded the Gestapo Hodges and Pinder on my dictaphone arresting me for being a male in Bournemouth (!) yes while in 28 Fell View, the thugs could claim anything they wanted. The yob sent to Morecambe library yesterday stopped me doing anything much at all and today the yob’s link to their silly games linked to MY emails found more serious interference where I could not do anything at all again. I have had to register via another server altogether. The use of lowlife yobs and what I consider to be their silly games when they ILLEGALLY link to MY email address, is because I caught unemployed yob TRAVIS DALTON and scum thaty floats at 45 Fell View using MY email addresses and pretending they did so with my assistance. I was going to send this just to P Lawson of “professional standards” (don’t laugh – he clearly has never read a dictionary) but then I find out what I find out about the DANGEROUS TAMPERING WITH MY ELECTRICAL SUPPLY AND THE THUGGERY IN DELETING RECORDS FROM SSE SECURE ACCOUNTS. Yours Carol Woods Ms. PS INspector Frith did not reply. Today I had a circular and the thief and fraudster in 26 AGNES JACKSON who is ONE from MANY to claim to be me had mail which ALWAYS happens, junk for me, MAIL IN MY NAME FOR HER. Thus still no custody records and no interview tape or CD whatever it is. To Inspector Frith, Lancaster police station by hand, 22 Feb 2018. After the wrongful arrest and false imprisonment (yet again) of 31/1/18 into 1/2/18, I still have not received my custody records despite calling in, leaving a hand written letter for the custody sergeant and sending at least 5 emails; can you assist? This is hand written on hand-done paper so there is no “confusion” as to who writes. I also note added breaches of PACE 1984 Regs in that I reported Misconduct in Public office of 2 more of yours, Sgt Pinder and PC Hodgson; within that I had made a citizen’s arrest of said 2 for assisting offenders and obstructing justice (E-CRIME, ID THEFT, FRAUD, FORGERY at least) in the theft of my lap top on which I type word docs 85% of the use given I have and never have had personal internet connection but can sometimes link via a WiFI source. I quote the Criminal Law Act 1967 (?) Sec 4 (1). The instruction then to the murderous lowlife Williams in 30 Fell View (bullied the former tenant of 28 to death with others such as Jackson in 26 and those such as Jarvis in 41 who did nothing but stood and watched) to retrieve an old video player from the yard shed after hiding in the shed for over 35 minutes to emerge when I went to my rear garden so that I would see with the deranged to pretend they had a 2nd computer as if his horrendous wife had been me having her lap top stolen by Pinder and Hodges 31/1/18. The INTENT (participation crime is also committed) was for me to go and buy another lap top (the guys in the Fone Shop Market St have to do as they are told and have done so previously when attempts to produce “evidence” to show I am not me has been manufactured) so that MY use after the theft of mine could then be said to be the lowlife in 30 using the video recorder he had in the shed which they were to claim was a lap top! The horrendous old thief in 30 Mrs JUNE FRANCIS WILLIAMS bankrupt has been ILLEGALLY accessing ALL I typed from my moving into 28 Fell View March 2014. She provided with ID as if she was me trying to give her my work experiences where she using MY name obtained a volunteer’s post in HMYOI Lancaster Farms in the education dept; she told to dye her grey/white hair a yellow colour to look like mine for her photo ID purpose. The repulsive MR has harassed and pestered me from moving in pretending I was Mrs. He has stalked me in cat PJ65 WLL which is 1 of 5 they have had IN MY NAME. Thus we have more than Misconduct in a Public office I think. While you said that another inspector would speak to me about Pinder and Hodges, no one spoke to me at all. I remembered your name a) because I have am almost photographic memory and am not mentally ill with dementia, b) because June Francis Williams was provided with an old reference of mine from LCC files which referee was Ms J FRITH – your legal rep IAN YOUNG doctored that reference of 1999 t6o make it seem to be of 2014 and for lowlife Williams to obtain by deception and so deluded she thinks she could be me. I told you of gross breaches of R.I.P.A. and have since filmed all the illegal wiring installed in 28 Fell View to allow E-CRIME (41,43,45,49,30,26,24,22,20,37, 23 at least) and the ILLEGAL GPS on my car installed 21/1/12. From Ms Carol Woods 28 Fell View LA2 9RP sorry I have no phone but please feel free to quote me. NHS sleaze in my case: I am not the only one to be able to prove their sleaze – they are not all “good guys and dolls”. Amid more of the usual lunacy on 8/3/18 in police-led organised crime LA2 (Lancaster area) on my return to Caton after being out experiencing the usual thuggery, I turned into Caton about 7 40pm and found an NHS ambulance parked illegally in a dead end, for what purpose? None I could see, there was no one in or out at all. I know what they are capable of pretending so pulled in and parked to see if anyone was using the service; nothing; I alighted to go and get photos: he drove off. I did get a photo; he was there for treasons of SLEAZE, nothing else and would have pretended to have dropped off someone (me) or even, collected someone (me). The INTENTION is to claim I ONLY JUST SELL MY HOUSE YET AGAIN AS TOO DISABLED TO LIVE IN IT! A small example here of the lunacy: I have scores more photos for any inquiry. It is harassment: I moved to 28 Fell View LA2 9RP 24/3/14 and within days this happens, at least 3 times, 3 sleazy “mental health” race to 33 Fell View (unoccupied then and now with the person invisible moved in on 9/3/18 no. 1014 yet none has moved out!) They pretend someone has rung in an emergency – me. The council, as I found out, had pretended I was in 33 Fell View and claimed that 28 did not exist but was part of 30 on one side and 26 on the other. They cover up the MISSING lady named on the electoral register who I have reported as NOT there thus “missing”. 5/4/14 I go to my car and find this seedy dollop dressed in overall and going to 12 Fell View claiming to be NHS calling there as I also apparently lived there with lowlife ELY; the use of hairdresser overalls was par for the course to pose as NHS. 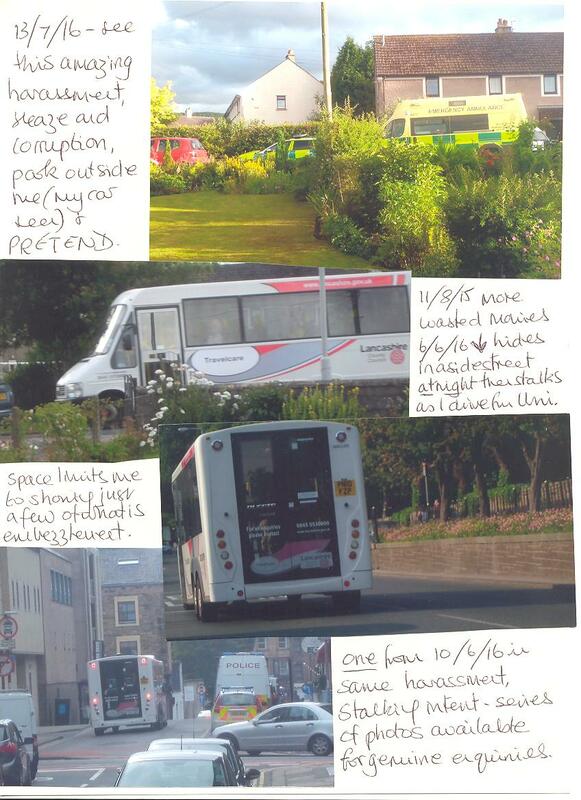 On 28/8/14 EK61 XYB driver had been hiding in her car parked outside a house number 14 on a street I and many use for parking when calling to Lancaster. 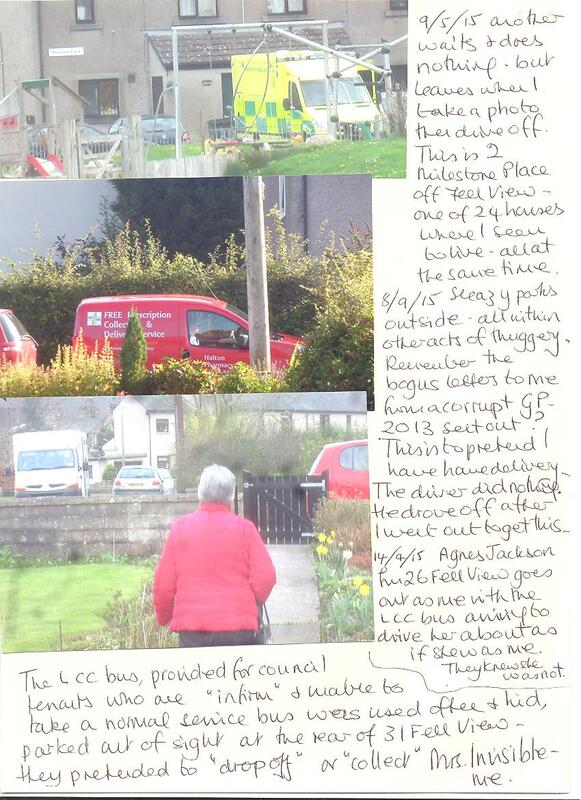 * As I parked, she sat up and drove off: the deranged was NHS pretending she had dropped me off and 14 was to be 14 Fell View where McGUIRE fraudster lives who has been PAID from March 2014 pretending I also moved in with her; she another unemployed, deluded roughneck paid to pretend I lived there and that she drove me about in RX02 TLU blue Mini. She also wears a hairdresser’s overalls. The use of house numbers ANYWHERE I am known to park (the ILLEGAL GPS on my car allows for this) is to match the lowlife round Fell View where I apparently live in at least 24 houses AT THE SAME TIME. *The hiding in cars is done daily, the drive lies across the front seats and the car looks unoccupied. 20/7/15 YD09 LPP a car used by various and often: always trying to stalk me, parking outside and pretending often using others to pretend they were me seen in the car! 24/2/15 and another “emergency” at 33 (for which read farce at public expense). Then it gets sinister: I go to Fleetwood for a day out and return to my car to find this thug waiting to pester. In the later ILLEGAL DETENTION of me 7/11/15 they then had a male they PRETENDED was Fleetwood psychiatrist in Lancaster police station who claimed I was too ill to be questioned; they tried to establish the link further after this thug. I went later to ask at Fleetwood; I knew there was no REAL psychiatrist in Lancaster police station that night and their CUSTODY RECORDS show that yet they carry on untouchable! What was I in the station for? Arrested for following lowlife thugs to Manchester airport, they going to Tenerife, they being DALTON unemployed for ever yob and his ditto mother, minus of course their passports, flights or knowledge as to where Tenerife was, where they had stayed or when they returned. They had and have no travel docs, no photos but what they do have is an unemployed thug who visits 45 who has made a statement to Gestapo stating that he saw me on Fell View between 5th and 10th Oct 2015 so had been there to follow them. Oddly MY travel docs, photos and so forth show I was in Barcelona and my car was at Liverpool airport so we have PERJURY. Not dealt with although proven and reported. Mrs M Dalton was used again on 10/3/18 to go out with thug in DE61 DBO car to be seen and said to be me: she has now left her grey almost white hair to be what it is when mine is the strawberry blonde she tried to be until end of 2017. I restrict this to here as 3 pages of attachments make this bulky enough without adding more photos and data. Ends Carol Woods Ms. PS the thug used on 10/3/18 in DE61 DBO red Audi was to repeat the old stalker and harasser BLEASDALE of 2 Hall Drive off Fell View caught stalking me OFTEN. All on film so the Gestapo think if DALTON is seen in a red Audi then somehow it is PROOF she went to Tenerife on 5 Oct 2015 via stalker Bleasdale’s red Audi WG03 DMW which he swapped after being found out for red Mercedes. A latest communication from Carol Woods, of Caton, Lancs. shows the lengths certain corrupt officers in Lancs. 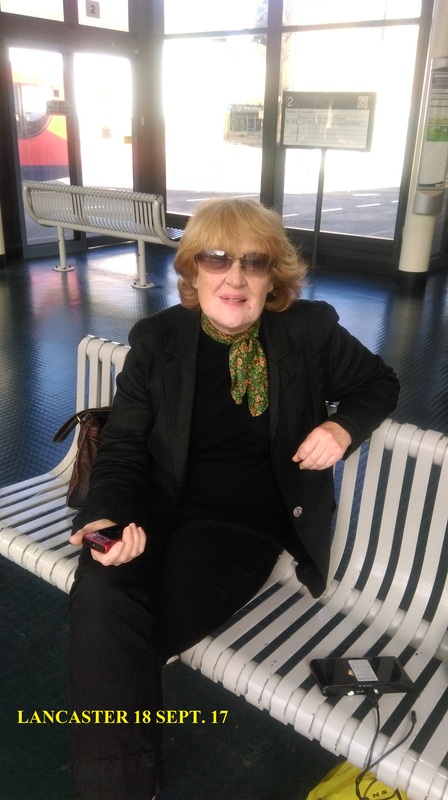 police will go to trying to make out that certain posts on this site are posted by her personally, when they are not and the entire site is under my, John Graham, of Bournemouth, UK’s control, and I have multiple witnesses to prove that to be the truth. These corrupt entities in Lancs. police have simply manufactured a pack of lies regarding Carol to cause distress and grief, so they can intimidate, harass and ARREST her, the latter of which they have done recently, but without charges being brought. I am willing to prove to any government official that I control everything on this site, and can state categorically and emphatically that Carol has never posted anything on this site – rather the posts are reproduced alone by myself from communications I have received – be they from Carol, or whoever. This is a true sworn statement by myself, John Graham, made without prejudice or coercion – 08 March 2018. E-CRIME LIBRARY AGAIN deprives me of Internet use. This is what I try to deal with: last night WILLIAMS in 30 pretended she was me and pretended to BORROW a computer in 34 Fell View, today of course was the usual fraud in orders with such as DPD van hiding where I was expected to park so that thug could say he delivered to me in a house there (I saw him and drove well away) DHL along Fell View with emphasis on thieves in 14 McGUIRE and blue Mini RX02 TLU being rewritten by any blue Mini that can stalk me; she claimed to be my daughter from 2014 and that I lived there and was driven about in that blue Mini, on lots of excellent photos to show that lowlife was stalking to pretend. This spoiled my use of my emails last Thursday, then I have to wait in for SSE who don’t call, it is not council; the council want me to go in as they want to say it is PROOF I HAVE JUST MOVED IN AGAIN. I hope to catch up with all in a few days: they still have not given me a receipt for my lap top and refuse me my custody records. Dear Sirs the photos attached show why I have done little these last few days, the INTENTION is manifold as usual with Lancs organised gangsters aka police. Last Thursday I went to use Morecambe library as it is open to 7pm and I rely on public libraries GIVEN THE GESTAPO STOLE MY LAP TOP ON 31/1/18. Even having that, I was still obliged to use public facilities often given the ILLEGAL wiring in 28 Fell View LA2 9RP which I rent (under duress) and which was wired up ready for my moving in on 24/3/14. Most know that since then, the lunatics have pretended that I have moved to live with unemployed lowlife in at least 24 council houses who have all been paid and paid to pretend to drive me about. Not one person has blinked an eye lid in that FRAUD, ID THEFT obvious FORGERY etc. The wiring was installed so that lowlife could use their INTERNET and phones as if it was my use. Found out with the wiring filmed and sent out to show how ILLEGAL and DANGEROUS it is (with not one comment at all from anyone), the LOFT NOISES have diminished somewhat but I still hear. I learned to differentiate between computer use and phone use and from where the user was, houses nearest me given the lay- out of Fell View incl mostly 30, 26, 34, 41, 43, 45 and with 20, 22, 12, 14, 23, 17, 39, 37, 31, 29 at least also taking some part. Thus at least 30, 41 and 43 STILL use their phones as if it is MY use and I still record the times, the user and whether it is phone or computer. Much led to yet another arrest of me on 31/1/18 as apparently I am a male from Bournemouth who harasses the thief and fraudster, lecher and pest Mr K WILLIAMS in 30 Fell View who pretends I am his wife and he claims he is MR CARL WOODS but that warrants no arrest apparently although proven beyond any doubt. His wife provided with ID in MY name by the Gestapo suggests police corruption. I was to be “seen off” on 31/1/18 but that “plan” failed. Thus they relied on claiming I run a web site and harass WILLIAMS that way. Williams I guarantee in his 70’s, a deluded dollop will never have used a computer in his life and would not know if anything about him was posted anywhere. I send out emails with attachments: if someone posts them that is their site not mine and thus the Gestapo decide I am the male who runs his web site and am from Bournemouth. Oddly they arrested me in 28 Fell View again which suggested to me that they knew I was not a male anywhere and certainly not in Bournemouth. I am unable to add to the internet entries I added in 2006 and 2007 because since then, given the THEFT OF MY HOUSE, THE WRECKING and LOOTING OF IT (Oct and Nov 08) I lost my notebooks with the passwords etc. Since that arrest (farce) the Gestapo have declined to send me the custody records despite requests by every medium possible. Why? The arrest of me on similar ludicrous charges in Nov 2015 found the custody records denied to me so I had a solicitor get them for me. I found they were false, recorded what was false and the Gestapo then produced ANOTHER record taking into consideration MY comments as to what was so wrong originally; I have 2 TWO custody records from 7/11/15. Thus they deny me the custody records again as they will be drivel as usual. BUT, they used a male yob who was sneaked into the station AS MR CAROL/CARL WOODS and he was to be ME released after I was “seen off” which did not happen, thus he TRAVIS DALTON thief and worse from 45 Fell View had to sneak back to 45 on 1/2/18 which I saw and filmed. 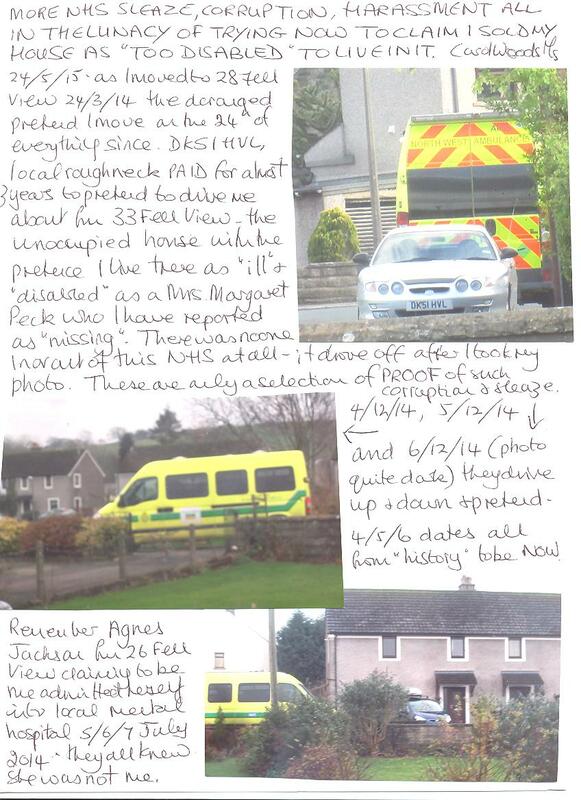 MY custody records will have “disappeared” and they will claim I was not there at all! BUT what about the male I am said to be from Bournemouth, a campaigner who campaigns for many not just me and who works on many cases at once. The Gestapo have STOLEN MY LAP TOP which was mostly for word docs anyway and only from June 2017. How then can I continue to run a web site? Thus let us consider that if I am the male blogger, I guarantee he would have continued to work all 31/1/18 and 1/2/18 when I was locked up before release. How can he be me as I was locked up with no access to a computer? His web site will show he continued to work; he didn’t even know I had been arrested again. Thus how can I be him? Thus if the lunatics pretend I was not locked up in arrest and deny me the custody records, then they can claim I was free to be him although hundreds of miles away; they even ignore the THEFT of my lap top. My lap top was accessed when I typed indoors at 28 with the data transferred to JUNE F. WILLIAMS aka Mrs C WOODS in 30 Fell View as proof she was me. In 2010 2 “friends” Diana Garner and Pat Jackson took 2 USB’s of data for “safe keeping” and BOTH were bribed to use the data and claim they were me as they had my data. But now, J Williams in 30 Fell View is to be me (one of many round Fell View) and so she has data in E –CRIME. The yob Dalton and his mother in 45 Fell View also claim to be me as Mrs C Woods and Mr. Others do in the lunacy. Thus all that considered and the plan to “see me off” failing 31/1/18, the Gestapo resort to another plan which is to claim I am the male from Bournemouth and have just moved to 28 Fell View! I moved again today in fact given the thugs and their vans all pretending and the deranged in 41 Fell View for example pretending to have collected Mrs Invisible yet again to drive about and care for WHICH THEY ARE PAID IN FRAUD TO DO. That is JARVIS aka Mr and Mrs C Woods! But, to make me run a social media site which I do not and never have but which such as Dalton in 45, Blenkinship in 34, and various unemployed losers round Fell View use and link to each other and PRETEND one is me this took place on 1/3/18. Late in the library and the coldest night of years, it was empty. Then as the Gestapo cruised past me on the prom they see me head to the library and send a pair of lowlife males to linger outside who then rush in as if with me. They take a computer each, next to each other and Facebook each other or whatever social site they used. One was to be me so, I did not log on at all. They gave up after 30 mins; by then it was almost 6pm, I went to log on and found the seedy old male in the photo attached had sneaked in and had logged on; THERE WAS NO ONE ELSE, THE CRIME WAS HIS. 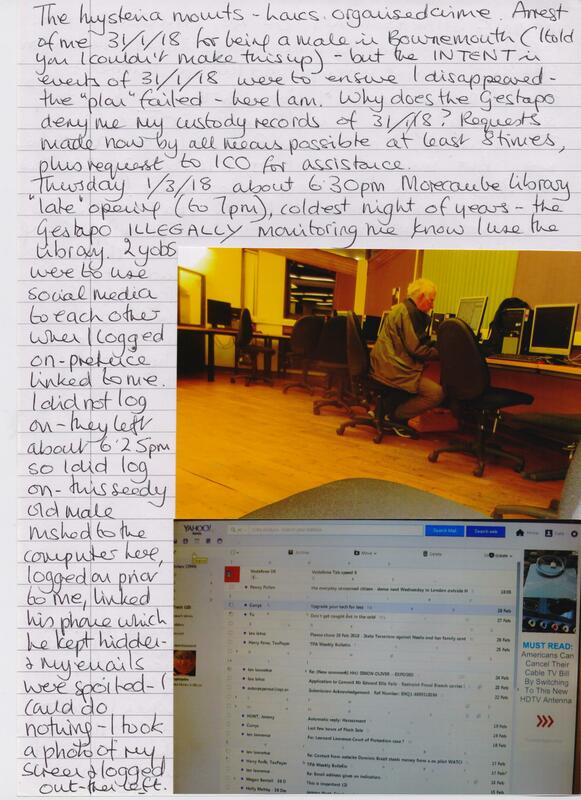 As I logged on well away from him, I watched him do what the yobs sent to Lancaster University library were to do when I went to work there, he linked his phone to the computer and then hid it again: that was ANOTHER LOG IN, IN E-CRIME. I could do nothing and trying to open my 2 usual email addresses BOTH were accessed and all I could do was to take a photo: the Gestapo via the seedy old male were trying to manufacture evidence I was using social media which made a mess of my emails. The photo is attached. I have seen nothing like this and after the thuggery and corruption of years, I have seen much. I logged off and left and watched the seedy old male do the same; he was not there to do anything for himself but to pretend HIS use was MINE and I was male. The use of yobs to be Dalton is usual but the use of seedy old males is to try to prove I am with that old lecher in 30 Fell View, Mr K Williams. Dear Sirs I waited in all day yesterday and most of today. Since 17th Feb when the supply was ILLEGALLY and DANGEROUSLY tampered with, I have sent emails and reported variously: no one has done anything at all. Since then I have been in every Sunday, Wed and Friday and only going out the other days after 2 or even 3 pm – it was too damn cold to stay indoors all day every day: I had to go out to find some warmth. CC to some who know of my case. Carol Woods Ms. NB I have no hot water or heating since 17 FEB 2018. had I not experienced this thuggery previously, I might have tried my hot water tap and that would have resulted in an explosion. I know not to try the hot water if there is no boiler; others may not have known. We’ve detected that your email could be about a potentially dangerous situation. If this is the case, please contact us immediately. Do not wait for a reply. If you smell gas or think you have a gas leak, please call the free Gas Emergency Services line immediately on 0800 111 999. In the event of an electricity power outage or electricity emergency, you’ll need to contact your electricity network operator. If your email is not about a potentially dangerous situation, you need not take action. We will reply to your email as soon as possible, usually within one working day. The information in this E-Mail is confidential and may be legally privileged. It may not represent the views of the SSE Group. It is intended solely for the addressees. Access to this E-Mail by anyone else is unauthorised. Any unauthorised recipient should advise the sender immediately of the error in transmission. Unless specifically stated otherwise, this email (or any attachments to it) is not an offer capable of acceptance or acceptance of an offer and it does not form part of a binding contractual agreement. Authorised and regulated by the Financial Conduct Authority for certain consumer credit activities. 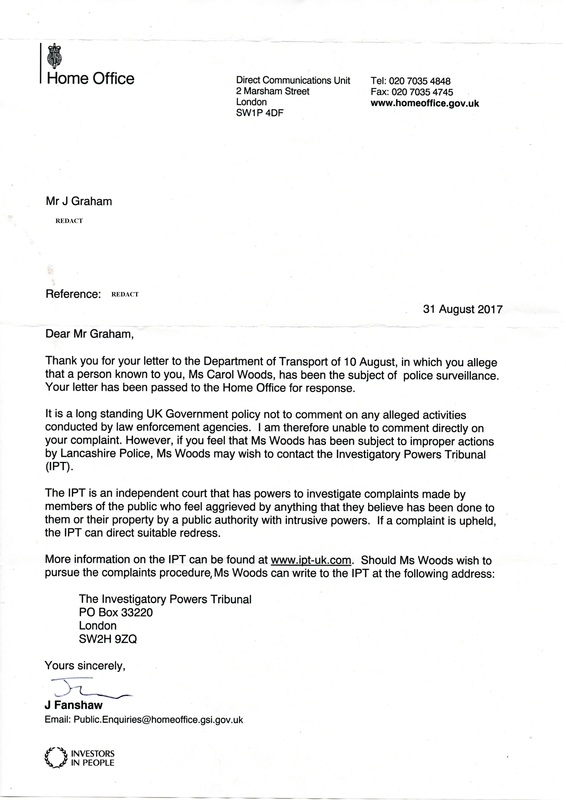 Regarding the illegal “tracking device” installed in Carol Wood’s motor vehicle, and despite CW’s asking for obligatory information from Lancs. 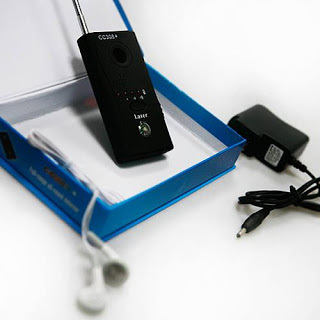 police regarding this device after her paying the proper “Freedom of Information Act” request fee at Lancs. police Hutton HQ in January 2017 was totally ignored, Lancs. police wanted a letter of permission, finally, from CW so I could interact with Lancs. police on her behalf so my complaint regarding this “tracking device” being installed in Carol Woods motor vehicle [and other matters] could be taken seriously. One original contact with Lancs. police was 6 months ago in March 2017 [below], which was ignored, as was every other communication sent until I contacted 3 chief constables a couple of months later regarding not being able to report serious crime to the police, which was also ignored by all sent to, so then I had no choice but to begin complaining about that. The “Investigations Support Dept.” of Lancs. police answered finally recently [below] requiring for a “letter of permission” from Carol Woods so as I could interact on her behalf regarding matters. Now, after that “letter of permission” was finally received in writing from CW, and sent to Lancs. 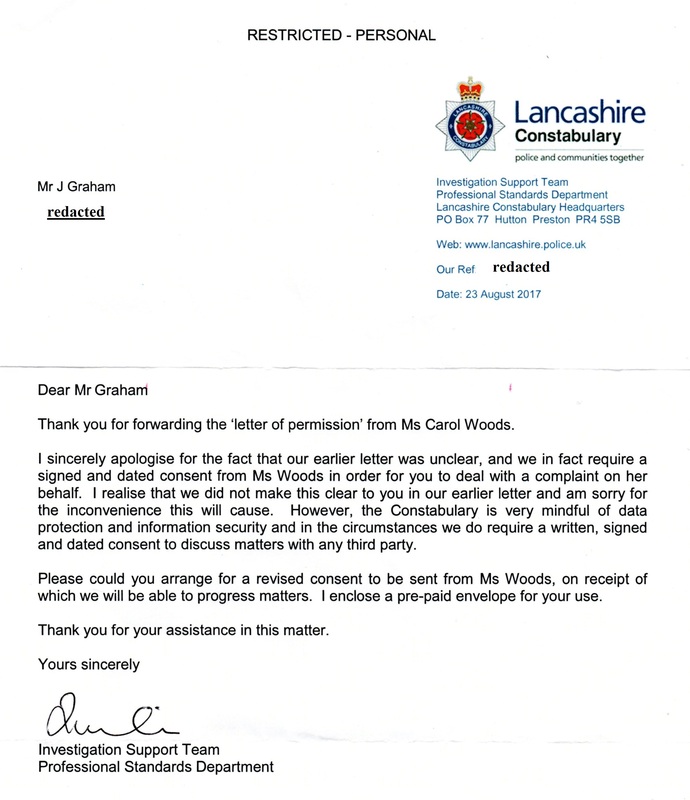 police as per their recent request received after 5 months from when this subject originally began from this end, still nothing is done by Lancs. police Professional Standards and “Investigations Dept” about this “tracking device”! hi, just got the mail – completely crazy at my return [Ms. Woods had been away on holiday…JG.] – preface my car was not at an airport car park – apparently I am the owner of a silver grey Yaris much newer than mine – I seem to be an Asian female with long, dark hair.